Gooseberries spent what seemed like years in the wilderness, so to speak, cruelly eschewed for the popular kids of the berry world, namely strawberries, raspberries and blueberries. However, they are recently enjoying a revival, with the nation once more embracing these plump, tart green berries. It's perhaps the tartness that puts people off initially but, for the initiated, this is exactly what gives them their appeal, too. 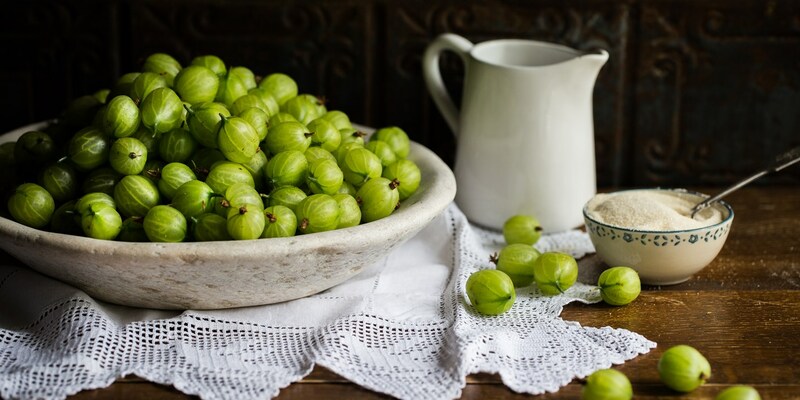 Being a staple British crop that has been enjoyed by home cooks for centuries, we have a multitude of ways to tame this fierce little fruit and this collection of gooseberry recipes should provide some handy inspiration next time you're faced with a glut. Famous for being incorporated into a number of classic British desserts – see Dominic Chapman's Gooseberry crumble recipe, Louise Robinson's Gooseberry pie and Gooseberry fool or Nathan Outlaw's Gooseberry custard tart recipe for inspiration – they also make an excellent accompaniment to savoury dishes. Food Urchin makes a punchy, fruity Gooseberry sauce to serve with mackerel (a traditional yet refreshing pairing), while James Mackenzie creates a delightful gooseberry ketchup for his Gammon osso buco recipe.